BRISBANE, Queensland, Australia, February 1, 2011 (ENS) – On the heels of widespread flooding in eastern Australia, the state of Queensland today is evacuating residents as a giant typhoon barrels across the Pacific straight for the Queensland coast. Tropical Cyclone Yasi is likely to cross Queensland’s tropical coast early Thursday morning, according to the Australian Bureau of Meteorology. The potentially dangerous cyclone is exceptionally large in size. The Bureau of Meteorology’s Queensland Regional Director Jim Davidson, says the bureau is closely watching Tropical Cyclone Yasi and has issued a formal Cyclone Watch. Rampaging across the southern Pacific Ocean, Tropical Cyclone Yasi easily spanned the distance between the Solomon Islands and Vanuatu on Sunday. The Vanuatu Meteorological Service says the cyclone is picking up strength as it veers away from the islands, travelling west towards Townsville in Australia. At midnight on February 1 local time, the U.S. Navy’s Joint Typhoon Warning Center reported that Yasi was roughly 1,620 kilometers (875 nautical miles) east-northeast of Cairns on the Queensland coast. 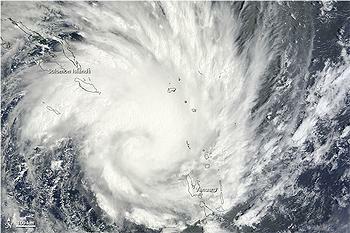 Yasi was measured with maximum sustained winds of 90 knots (165 kph, 103 mph) and gusts up to 110 knots (205 kph, 126 mph). The tropical coast is likely to begin feeling the first effects of Yasi on Wednesday morning, with damaging winds starting to impact coastal and island communities as the cyclone approaches. Authorities are going from door-to-door in northern Queensland ordering people to leave their homes to escape a predicted two-meter (seven foot) storm surge. Yasi has the potential to make landfall in Cairns with wind speeds in excess of 100 knots (185 kph, 115 mph), making it more powerful than Cyclone Larry, which devastated the north Queensland town of Innisfail in 2006. The Joint Typhoon Warning Center predicts that favorable conditions will intensify the storm, which could peak at 125 knots (230 kph, 144 mph). On the Queensland coast, the Abbott Point coal terminal has been closed, and trains and ferries will not travel until the cyclone has passed. 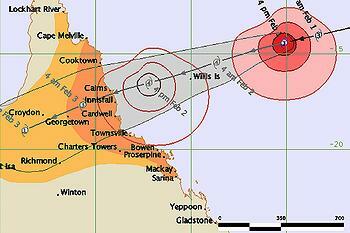 Some 300 schools across northern Queensland will close on Wednesday until further notice. In Townsville, shelters have been opened for people who are either homeless or living in caravan parks. Unless they are asked to evacuate, emergency officials say residents should stay home. “People who have a home are much safer in their own home and we would encourage people to shelter in place,” the premier said. Although the floods of December and January covered more than half of Queensland, Premier Bligh says emergency officials are ready for this new test.